Megan Tyminski reacts to the news that she has become a recipient of the Udall Scholarship. Photo by Josh Murray, MU Office of Undergraduate Studies. It was an article about beekeeping that Megan Tyminski wrote for the Columbia Daily Tribune that started Tyminski on a path towards the Udall Scholarship. The article caught the attention of MU Director of Fellowships Tim Parshall, who contacted Tyminski and encouraged her to consider applying for the Udall Scholarship. Megan Tyminski, who is a junior majoring in science and agricultural journalism, recently was named … Expand ▸Megan Tyminski, who is a junior majoring in science and agricultural journalism, recently was named MU’s most recent recipient of the Udall Scholarship. Photo by Maggie Teson. The Udall Scholarship honors the legacies of Morris and Stewart Udall, whose careers had a significant impact on Native American self-governance, health care and the stewardship of public lands and natural resources. The award recognizes students for leadership, public service and commitment to issues related to Native American nations or to the environment. Tyminski, a junior majoring in science and agricultural journalism and minoring in sustainable agriculture, is one of just 50 students nationally to earn the Udall Scholarship this year. As a Udall Scholar, she will receive $7,000 for academic expenses and access to the Udall Alumni Network, which is an association of individuals working in environmental fields who share ideas, advice, and job and internship opportunities. Tyminski’s selection for the scholarship came because of her commitment to environmental related issues, which she has been passionate about for as long as she can remember. She recalls hiking with her parents and picking raspberries and foraging for mushrooms with her grandfather. Since coming to MU, Tyminski has become an advocate for the environment. 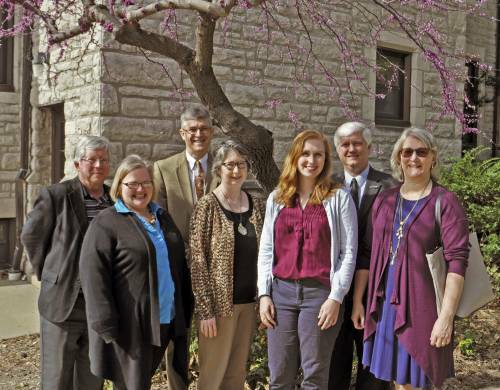 Megan Tyminski, third from right, after learning of her honor, with her nominators (front row, left … Expand ▸Megan Tyminski, third from right, after learning of her honor, with her nominators (front row, left to right: Mary Hendrickson, assistant professor, rural sociology; Sharon Wood-Turley, assistant teaching professor and program chair, science and agricultural journalism; and Karlan Seville, communications manager, MU Operations). Also surprising Tyminski at the presentation were (back row, left to right: Tim Parshall, director, MU Fellowships Office; Jim Spain, MU vice provost for undergraduate studies; and Bryan Garton, CAFNR associate dean and director of academic programs). Photo by Josh Murray. During her first year at Mizzou, Tyminski became a member of Sustain Mizzou, which is a student-run nonprofit organization dedicated to promoting sustainability through education, cooperation and local action. Later, she became the organization’s vice president of projects and founded a program called Sustain Mizzou Beekeeping. 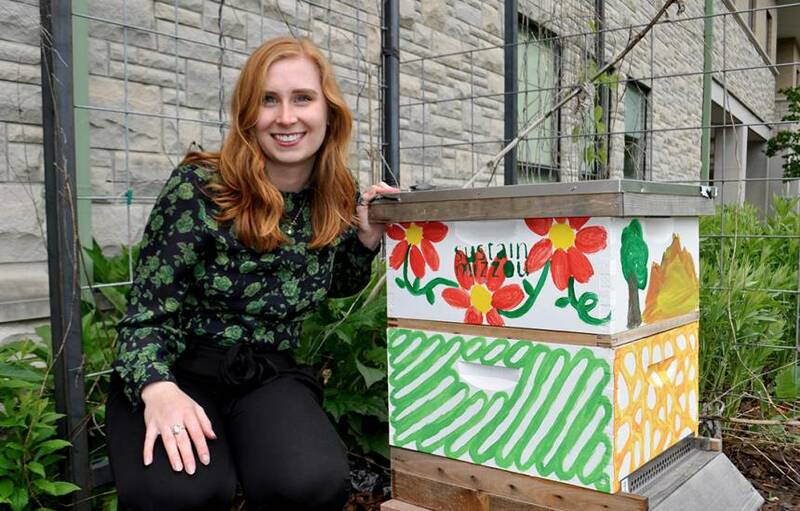 Because bees and other pollinators play an important role in maintaining the health and diversity of ecosystems, she started the program to learn more about bees and educate others. Currently, Tyminski manages two beehives located in the butterfly garden near Eckles Hall. She helps host regular hive checkups that are open to the public. Tyminski is also a communication intern for Mizzou Botanic Garden, where she has the opportunity to educate people about bees and other pollinators like birds, bats and butterflies. She helps organize pollinator day camps for the Boys and Girls Club of Columbia, Columbia Public Schools, MU student organizations and 4-H, which is a youth development organization. Tyminski wrote a booklet to supplement what people learn at the pollinator camps. Both Columbia Public Schools and the Osher Institute for Lifelong Learning distribute the booklet. Looking for more opportunities to educate people and advocate for the environment, Tyminski became the communication intern for Missourians for Monarchs, which is a collaboration of citizens, conservation and agricultural organizations, government agencies, utilities and agribusinesses committed to pollinator conservation. She is helping the organization create a website and raise awareness about the importance of monarch butterflies in Missouri. This story initially appeared here on the MU’s Fellowships Office site.